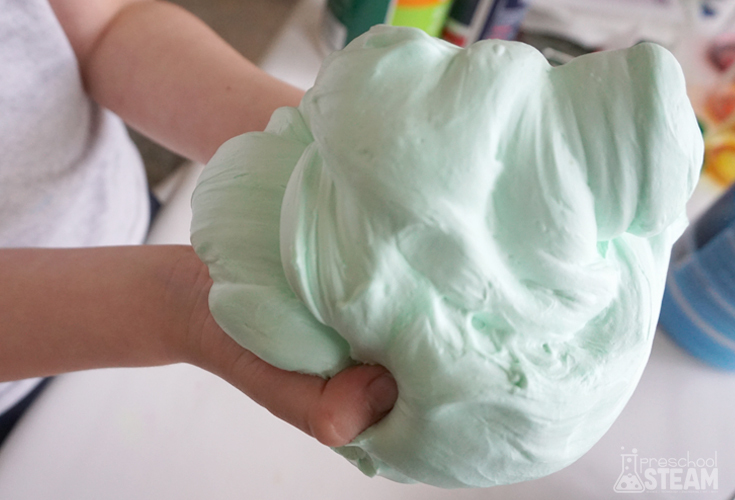 This easy slime recipe puts a fluffy twist on our classic slime recipe. 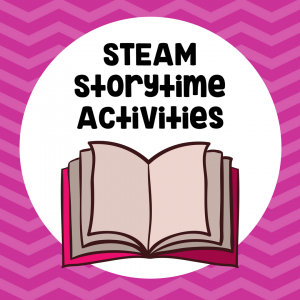 With just a few simple ingredients you can have lots of exploration and fun with sensory play. 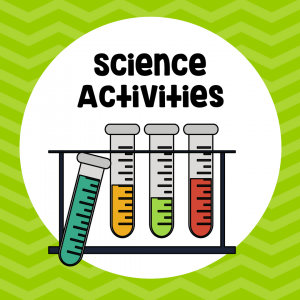 Allowing time for sensory play and exploration is an important part to help start thinking like a scientist! Children use their senses (touching, tasting, smelling, seeing and even moving) to explore and understand the world around them. Sensory play is an activity that stimulates your child’s senses. 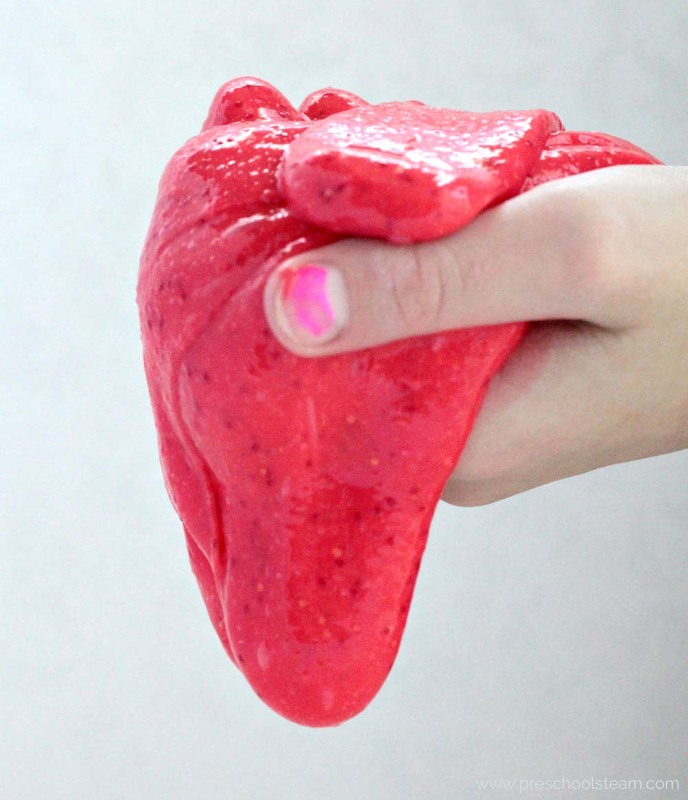 One of our favorite sensory play activities is playing with slime! Step 1: Pour 1/4 cup glue into a large bowl. Add ¼ cup of water and stir with spoon or craft stick until combined. 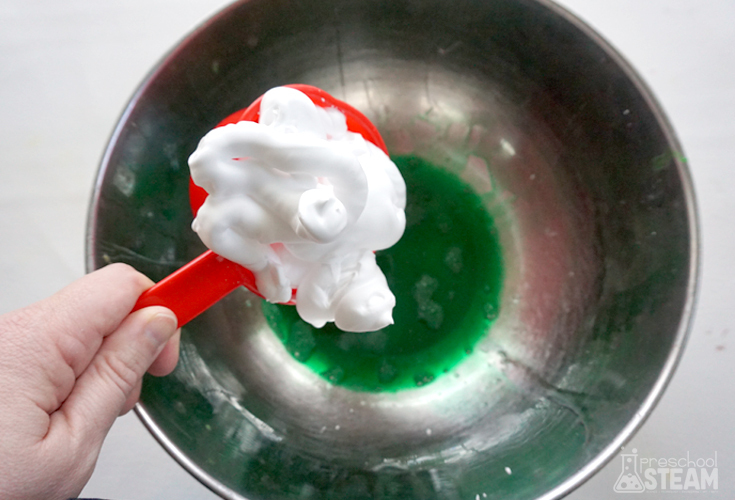 Add 5 drops of food coloring and mix well. 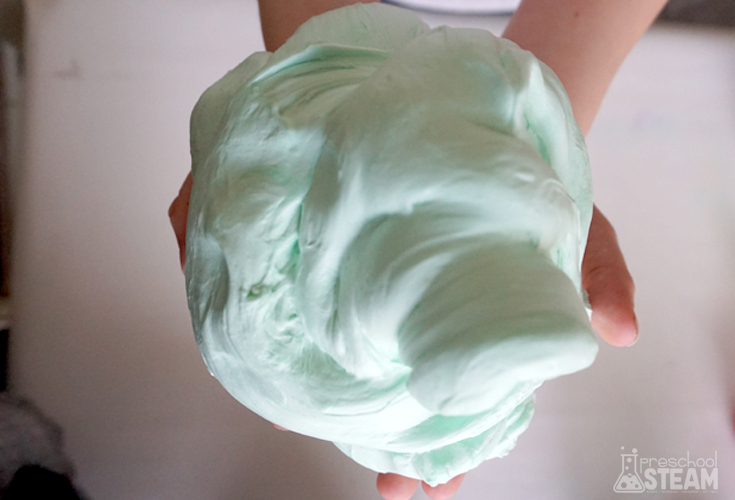 Step 2: Stir in 1/2 cup -1 cup of shaving cream depending on how thick you want your slime to be. Stir the mixture. Step 3: Add 1/4 cup liquid starch and mix until thick and slimy. Knead the slime. The slime will be sticky at first but keep kneading it until all the ingredients form one ball of slime and the bowl is clean. 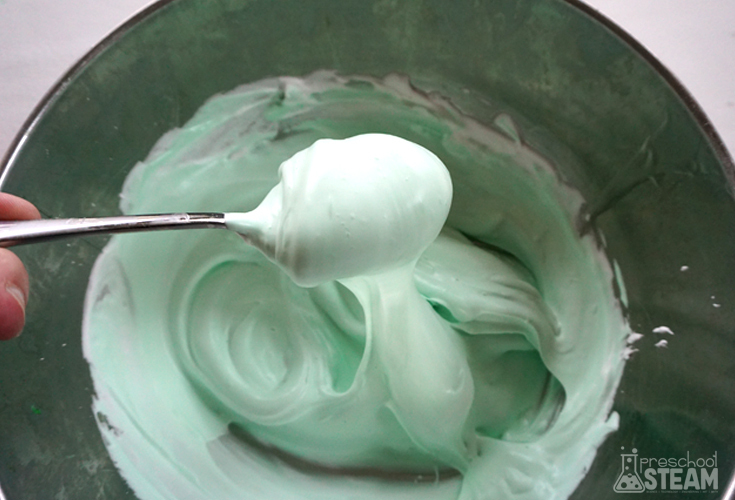 If the slime is still sticky, add a little bit more liquid starch. Different brands of ingredients react differently. Experiment to get the right consistency. 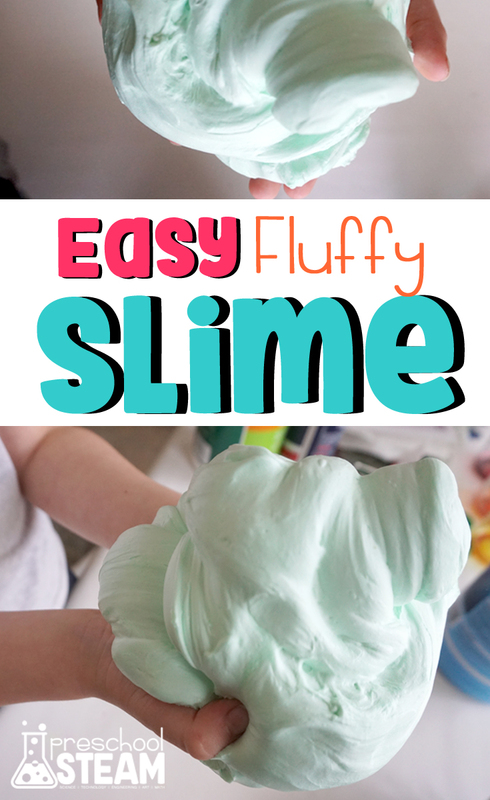 Play with slime immediately, the fluffiness will deflate over time. What’s the STEAM Behind It? When liquid starch and PVA glue mix, it creates cross polymer chains. A polymer is a long chain of repeating molecules. As more chains stick together, they can’t move around and the solution gets thicker thus creating slime. Adult supervision is recommended. This activity is not recommended for children who still put things in their mouth. Wash hands immediately after playing with the slime. 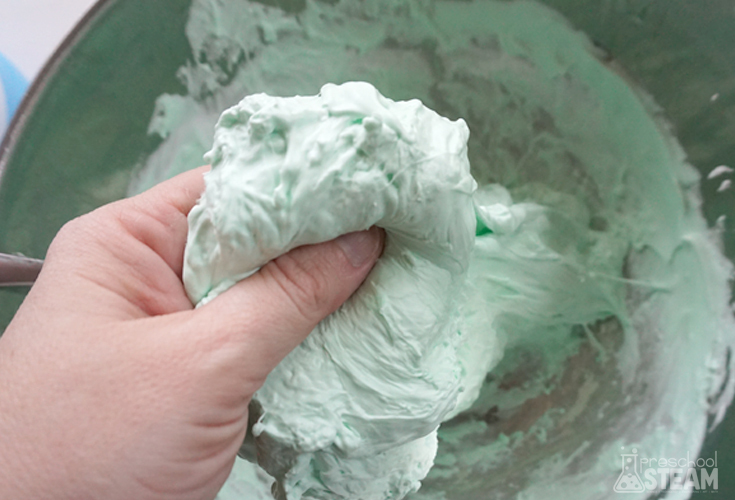 Dispose of slime properly when finished.